We are delighted to announce the winners of the January 2019 Inspiration Challenge! First of all, we would like to thank each and every one of you who took the time to create such wonderful cards for this challenge. We loved gazing at the gorgeous and unique designs that you came up with. Thank you for sharing your amazing skills with us! The first one that caught our eye was this pretty and colorful card by Hussena! It features our Bride-To-Be Stamp and Die Set and Doodled Dots Cover Die. Hannelie has been a regular in our past Inspiration Challenges and she has done it again with this marvelous card!!! There are simply no words needed to describe this beauty. Here she used the Sketchy Floral Stamp Set. Stamping, embossing, die-cutting, ink blending, and a bit of coloring – Maura did it all! And the end result is breathtaking! Don’t you agree? Her card features the Inked Flora Stamp Set. We simply cannot get over how beautiful Linda’s card is! Both the colorful background and the lovely Peony Dream 3D Die Set images make her card a total standout! Congratulations to all the winners! We encourage you to spread the word and use the Challenge Winner Badge above! Feel free to post it on your blog or on your social media account. All four winners will each receive a $30 Gift Certificate to our store. Please email us at winner@altenew.com with the subject line “January 2019 Inspiration Challenge Winner” and we will set you up with your prize. ***Due to the bulk of emails that our team receives on a daily basis, kindly give us 3-7 business days to process your prizes. Thank you! Thank you to all those who joined our January 2019 Inspiration Challenge! Our February 2019 Inspiration Challenge is in full swing! Feel free to check it out, get inspired, and join in the fun! Congratulations to all of you. The Altenew Inspiration gallery is always chok full of one beauty after another. Don’t know how you manage to select favorites! Wow, I am so excited to have my card chosen!! 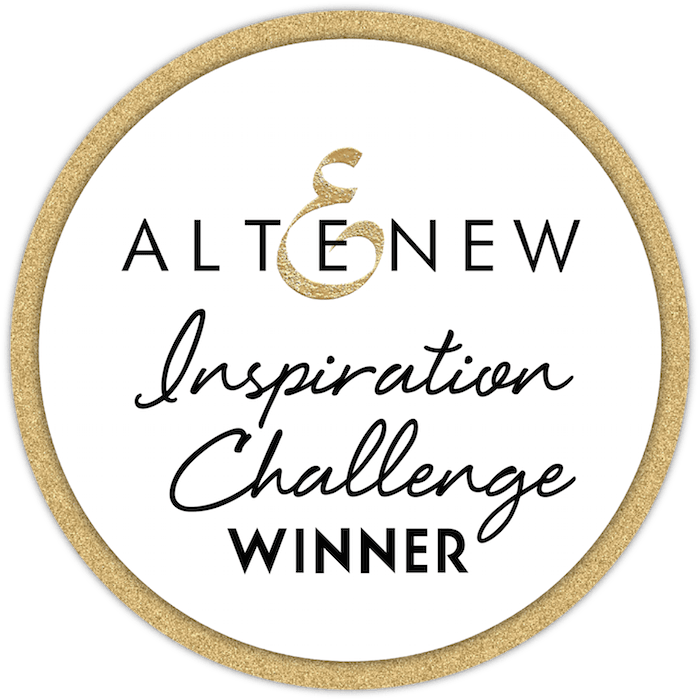 My first time winning at the Altenew challenge – I LOVE my Altenew stamps, and now I get to choose more!! Woo hoo! Congrats to Hussena, Hannelie, and Linda on their gorgeous cards! !